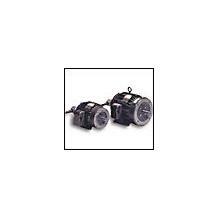 Vector Drive Motors are stocked in either totally enclosed blower cooled with an attached constant velocity fan or totally enclosed non-ventilated construction. All motors are supplied with a 1024 line count encoder. Horse powers are available from 1 through 500 HP in NEMA frame sizes from 56C through 5009L. The motors are ideal in industrial applications where full torque is needed from base speed down to zero speed. Applications include test stands, material handling, packaging equipment, printing presses, and others requiring exact speeds and positioning.